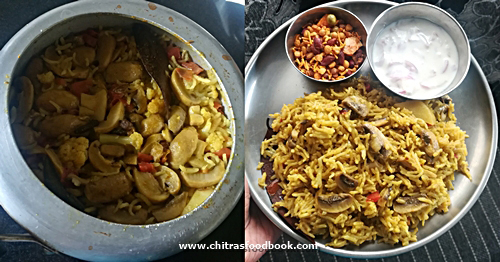 This mushroom biryani recipe ( kalan biryani in Tamil) is an interesting, easy South Indian biryani recipe I learnt from my neighbor who is from Madurai, Tamil nadu. 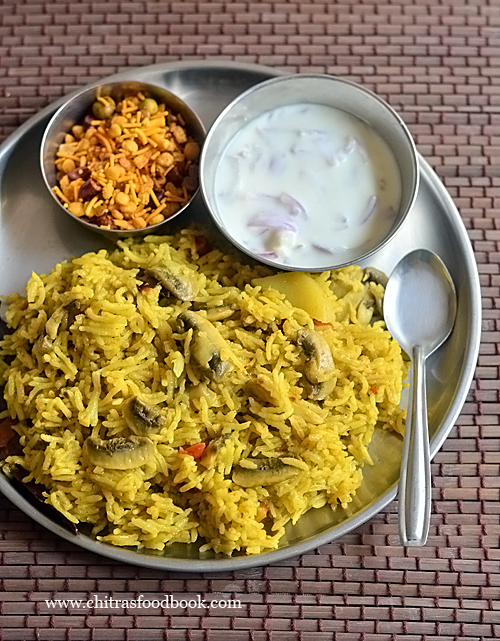 It is an easy and flavorful biryani recipe without coconut milk. I prepared it with basmati rice (loose basmati rice from Reliance fresh). 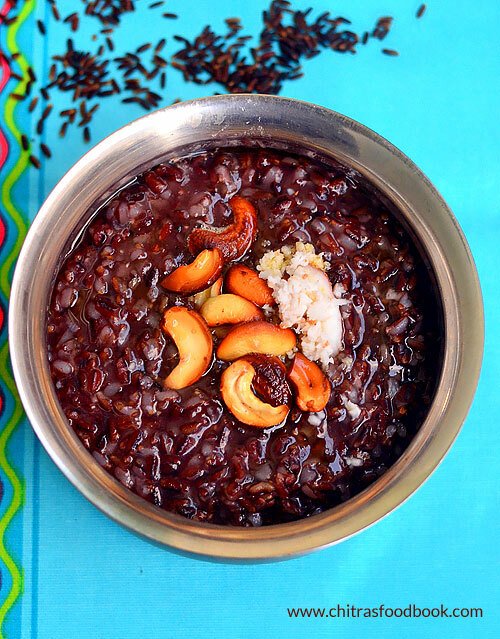 You can use jeeraga samba rice or normal rice too. I have tried many biryani varieties like Dindigul thalappakatti biryani, Coimbatore Angannan biryani, Pakistani biryani and Thala ajith biryani with mushroom replacing chicken and mutton. Recent days I have been trying varieties of mushroom recipes at home. Last weekend I tried this kalan biryani using a pressure cooker easily. This is my neighbor’s family recipe. When she shared it with me, I became so happy and tried it confidently. As expected, it came out so good. I loved the flavor of mushroom and freshly ground masala in this biryani. I did not make any side dish. I just served it with onion raitha. If you like, you can make brinjal masala gravy or plain salna as side dish for mushroom biryani. Everyone liked it very much. 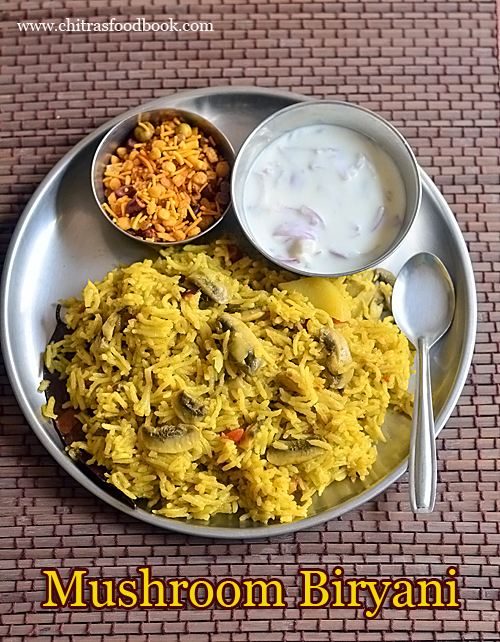 You can make this healthy mushroom biryani for lunch box as it takes less preparation time. Lets see how to make mushroom biryani recipe / kalan biryani with step by step pictures. Small onion / shallits OR big onion - 7 nos /1 no. Wash and clean mushroom. Slice it and keep aside. Wash and soak basmati rice for 15 minutes. Wash and chop onion, tomato. Grind all the ingredients given under “to grind” to a smooth paste. Set aside. Heat oil in a pressure cooker base. Saute cinnamon, cloves, cardamom, bayleaf, black stone flower. Add onion, saute till transparent. Add the ground masala paste and saute in low flame till raw smell goes off. Add chopped tomato and saute till mushy. Add sliced mushroom and saute till it shrinks. Add salt, turmeric powder, biryani masala powder or garam masala powder. Mix well and add soaked rice along with water. Mix gently. Close the pressure cooker and keep the flame high. Let the steam comes off. Then put the weight valve and reduce the flame completely. Cook for one whistle. It takes 8 to 10 minutes. Switch off the flame and let it rest till steam releases completely. Open the cooker and fluff the rice gently with a fork. 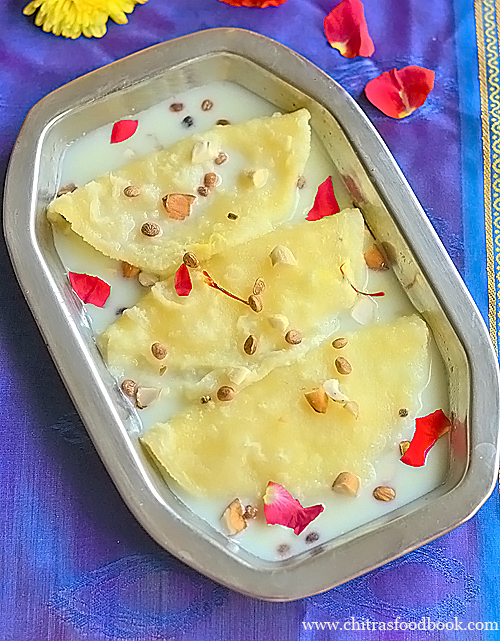 Serve hot with onion raita or brinjal gravy / salna as side dish. Add more green chillies for spicy biryani. For variations, you can replace green chillies with red chilli powder and dhania powder. In that case, you can add 1 tsp each. 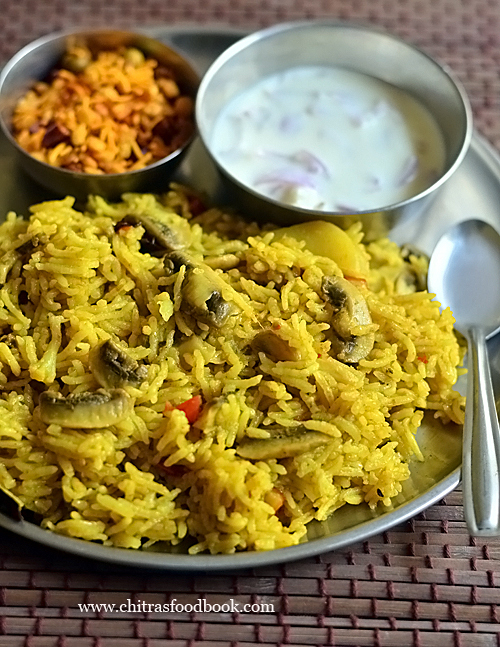 Try this yummy mushroom biryani recipe and enjoy ! 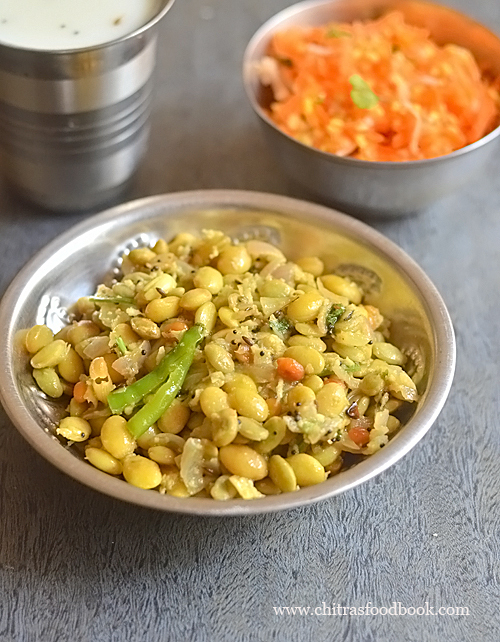 Avarekalu usli or avarekalu sundal is a Karnataka special avarekalu recipe ( Hyacinth beans / field beans in Engligh, Mochai In Tamil, Lilva papdi in Hindi) that is served as an evening snack along with tea. Some people prefer to have this as a side dish for akki roti / ubbu roti, rice and chapathi. My school moms friends told its preparation procedure is similar to avarekalu palya. 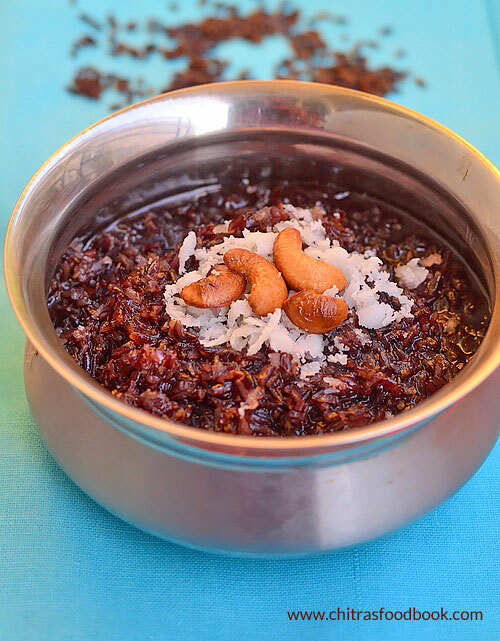 Its a very simple and healthy recipe with less ingredients and no grinding job. 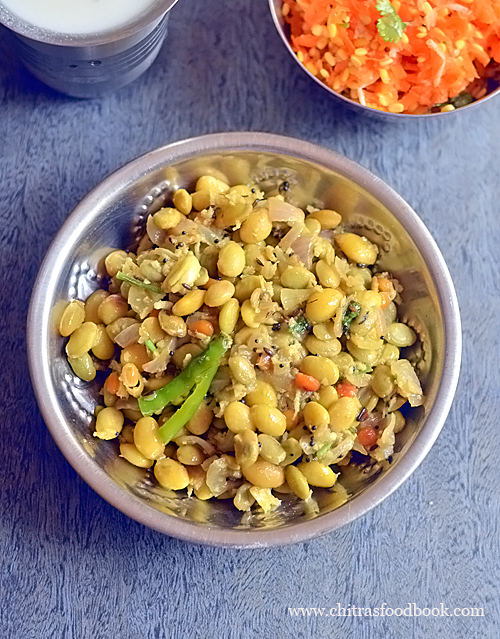 Just temper the cooked avarekalu with mustard, chilli, onion, garlic and garnish with lots of coconut. Based on the inputs from my friends, I tried it for the first time by watching an YouTube video by Mallamma ajji. 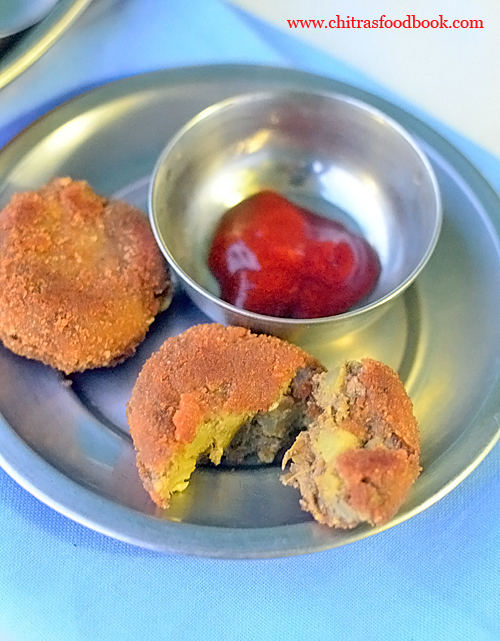 This recipe is of Gubbi, Tumkur style. I made slight changes in the original recipe and tried it. Actually I found two versions of avarekalu usli recipe. 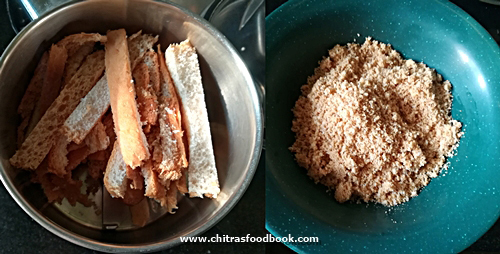 One is a simple way which I have shown below and the other one is with ground coconut masala. As I tried for my lunch to serve as sundal, I chose this easy version. 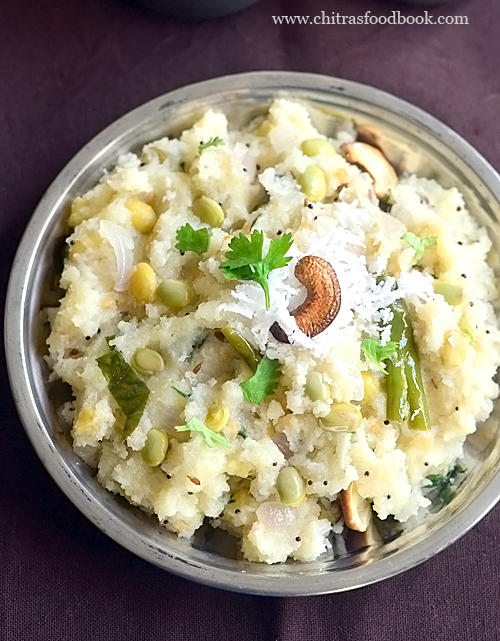 If you have cooked averakalu ready in hand, you can prepare this usli under 5 minutes. You can also make it directly in a pressure cooker using raw field beans. You can make it semi solid or dry in consistency by adjusting the water quantity. 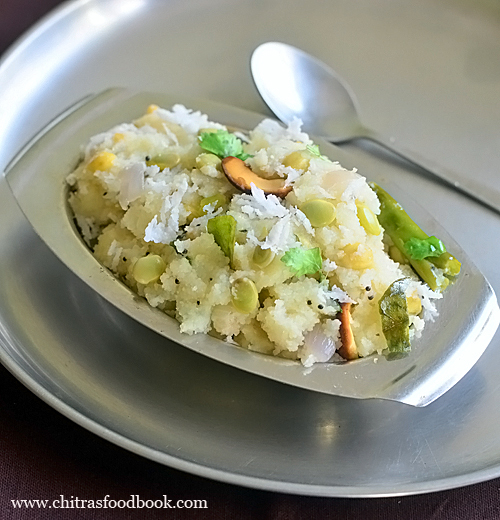 Friends try this easy, Tumkur style avarekalu usili recipe. You will love it. Its so easy and quick to make. We enjoyed it as a snack. 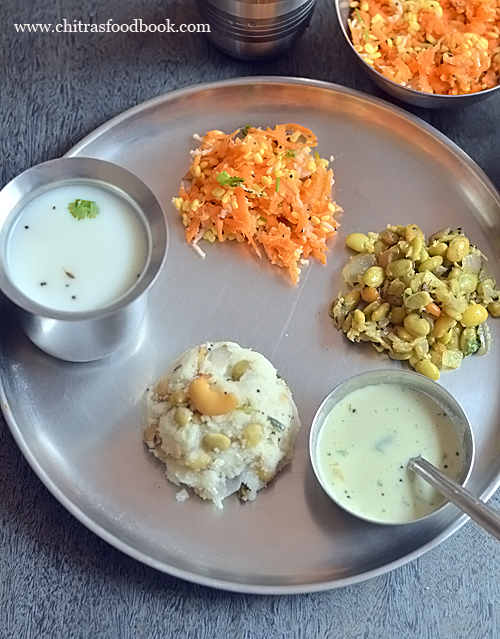 Ok, lets see how to make Karnataka special avarekalu usli / avarekalu sundal recipe with step by step pictures. 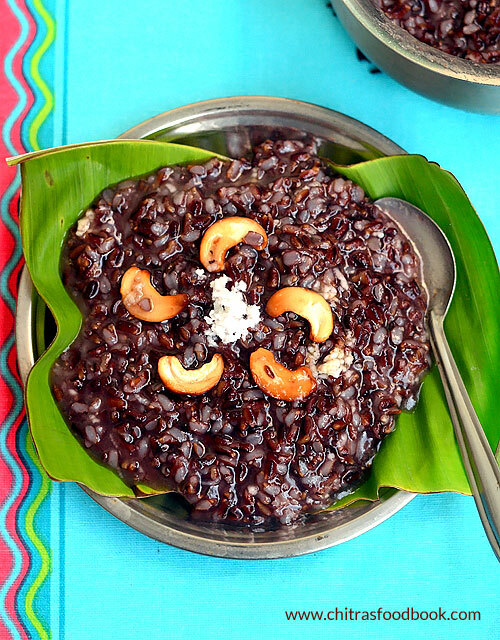 Do check out my interesting and easy avarekalu recipes like hitikida avarekalu saaru, avarekalu pulao, avarekalu sagu, avarekalu mixture, avarekalu huli, avarekalu soppu palya. 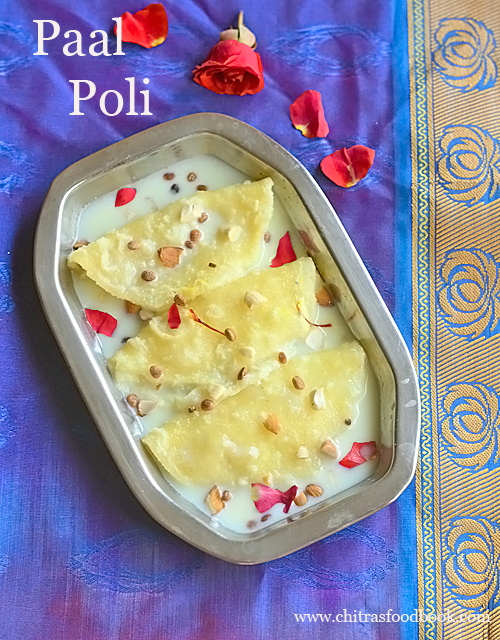 Avarekalu usli recipe for evening snacks. 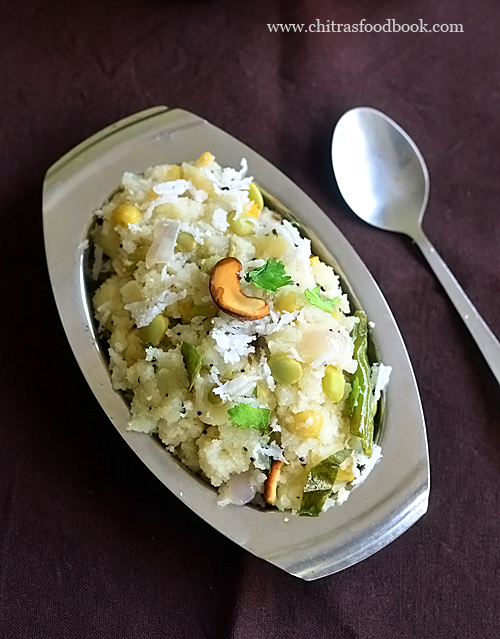 It can also be served as side dish for rice, chapathi and akki roti. Wash and keep the avarekalu. Finely chop onion, slit green chilli and coriander leaves. Heat oil in a pressure cooker base. Splutter mustard, curry leaves, green chilli, onion, crushed ginger and garlic. Saute till transparent. Add salt, hing and avarekalu. Saute for a minute. Add 1 cup of water and pressure cook for 2 whistles in low flame. Open the cooker and add grated coconut, coriander leaves. Mix well. Add water if needed. Give one boil. Dry roast cumin seeds and methi seeds. Powder it. Add the powder to the boiling avarekalu usili. Mix well and switch off the flame. You can make it semi solid in consistency or dry as you like. 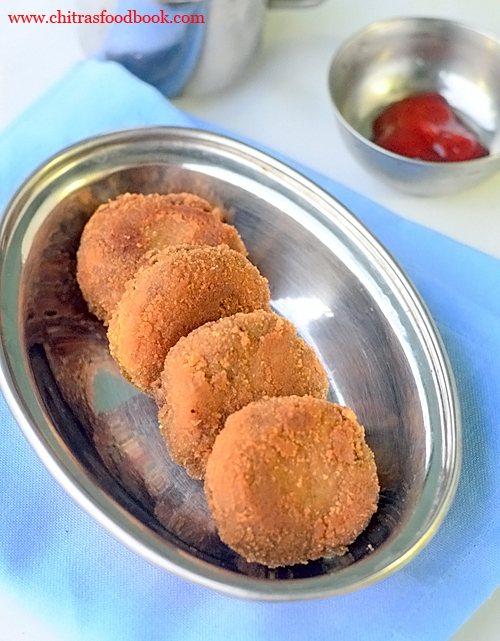 Serve as evening snack or along with ubbu roti / akki roti and rice. Wash and keep the avarekalu ready. You don’t need to peel the skin of avarekalu. You can use it as whole ones. ( I used cooked avarekalu. So I just tempered all the ingredients in a kadai and made this usili. If you are using raw, uncooked avarekalu follow the procedure given below. So the step by step pictures vary from the instructions). Chop onion, slit green chilli, grate coconut and chop coriander leaves. Keep it ready. In a pressure cooker base heat oil and splutter mustard seeds, curry leaves. Add slit green chilli and finely chopped onion. Saute till onion becomes transparent. Add crushed ginger and garlic cloves. Saute for a minute. Add avarekalu, hing and saute in oil for 2 minutes. Lastly add required salt and 1 cup of water. Keep the flame high. After the steam starts to come out, put the weight valve and lower the flame. Pressure cook for 2 whistles in low flame. Open the cooker lid after the steam is released. Add grated coconut and chopped coriander leaves. Mix well and check for water content. If the usili is too dry, add 1/2 cup of water else give one boil. Let it be semi solid in consistency because it will become thick and dry once it cools down. Dry roast methi seeds and cumin seeds in low flame till methi becomes golden in color. Grind to make a fine powder. Add this powder to the avarekalu usili, mix well and switch off the flame. I made it slightly dry to serve as sundal. 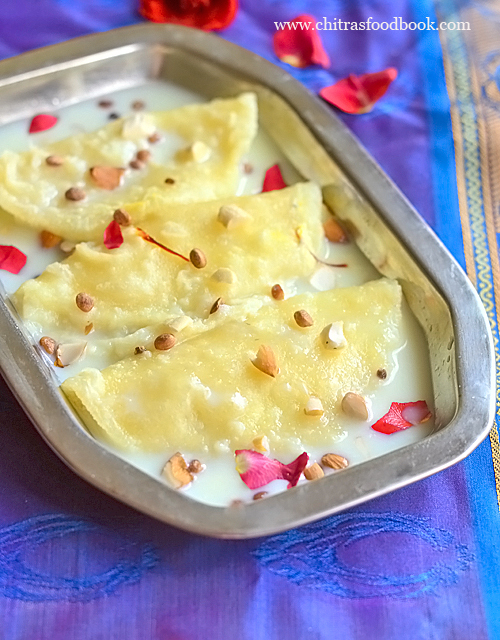 Enjoy with akki roti/ ubbu roti, rice or as a snack along with tea ! For variations, you can grind green chilli, ginger and garlic and make it as a paste. Add along with onion and saute it. To make this as a gravy, grind green chilli, coconut, coriander leaves and cumin seeds. Make a paste and add to the avarekalu, pressure cook. You can serve it with chapathi and akki roti. 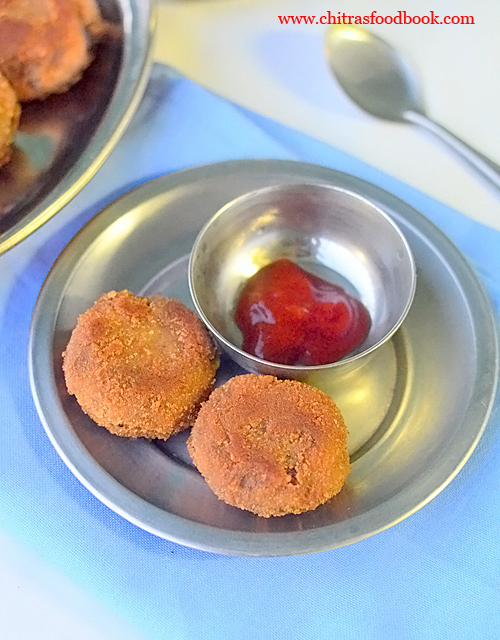 Try this easy, interesting avarekalu usili recipe and enjoy a healthy snack. Technorati Tags: avarekalu usili,avarekalu usili recipe,avarekalu sundal,avarekalu sundal recipe,how to make avarekalu usili,avarekalu recipes.